So when you’re reading material in the GED Reading Test, it’s important that you understand what Point of View it is written in. To figure out what Point of View the test is written in simply ask yourself: WHO IS TELLING THE STORY? You should also know that there are four Types of Views any story will be written in. And you can determine the Point of View by simply looking for keywords throughout the story. Below is a chart that will define each point of view, identify the keywords of each Point of View and then offer an example of each. Example: Together, we walked to the mountain and I couldn’t believe how far it reached into the sky. Example: Together, they walked to the mountain and she couldn’t believe how far it reached into the sky. Example: Together, they walked to the mountain, and they couldn’t believe how far it reached into the sky. Example: Together, you walked to the mountain, and you couldn’t believe how far it reached into the sky. 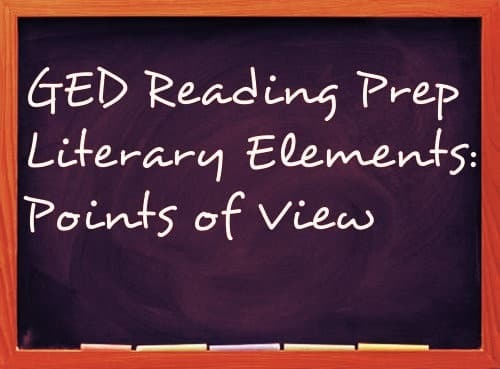 Now, as your studying, be sure to become aware of the different Points of View with each story you read. This is a simple thing to quiz yourself on and then check back with the chart above to confirm your answer.